This is the first post in the Eating the Big Apple series. I seriously don’t know why there isn’t an obsession about really, really good soba. Ramen has already taken this nation by the storm. It’s how David Chang made a name for himself. Lines at Ippudo in New York are notoriously long, and can we even count the number of people desperately trying to get into Guchi’s Midnight Ramen here in Boston? Soba seems to be a quieter affair. For most people (me included), it is a humble noodle that’s served on the side, almost like an afterthought. It may play second fiddle to fried tempura, or could be tossed together with a bunch of other flavorful ingredients. Almost never is it allowed to shine on its own as the main centerpiece. In fact, I don’t think Boston has a single restaurant that makes its own soba. At most, soba is served as a token noodle dish as part of a menu predominantly filled with fusion sushi rolls, shrimp tempura, and salmon teriyaki. This is why I had to go to New York to seek out this rare specialty. Welcome to Soba Koh in the East Village. Soba Koh is really unique because it specializes exclusively in soba. The menu largely comprises various soba offerings, divided up between “cold noodle” and “hot noodle” dishes. 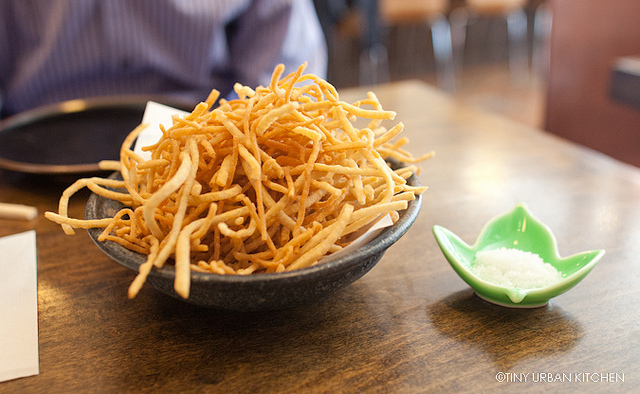 There are also other fun side dishes, such as crab chawan mushi, edamame, and tempura. By and large, however, a majority of the dishes incorporate buckwheat flour in one form or another. A noodle master makes soba (by hand!) from organic buckwheat flour several times a day. If you’re lucky, you just may catch him in the window cutting perfect strands of soba using his crazy huge soba cutting knife. Bryan and I were lucky enough to arrive just as he was beginning to cut these gorgeous noodles. I was so excited I took a short video of him at his craft. Once he finished making the noodles, we reluctantly went back to our seats and started to peruse the menu. I loved the clean, bright, and open space. It felt airy, modern, yet comfortable at the same time. The menu was full of fun and interesting soba-themed dishes that I had never seen before, so of course I had to try as many as I could (and we still didn’t get to try them all!). Agedashi Sobagaki (fried soba “gnocchi”) – a deep fried ball made with soba flour, stuffed with ground chicken, and served in a dashi-based broth (topped with shredded daikon – the type you see served with tempura), was interesting more in from an intellectual curiosity perspective than from an actual “taste” point of view. We found it a bit starchy and bland, though it was certainly unique and not something we’d ever tried before. If you’re limited on stomach space, however, I’d skip this. It was very dense and heavy, and we were about half full before we even got started on the good stuff. Similarly, fried soba noodles (Age Soba) were delicate, crunchy, and fun to eat, but didn’t offer anything particularly creative or “wow” in terms of flavor. The only other soba-themed appetizer that we did not have a chance to try was the Soba Risotto, a fascinating dish that consisted of crab, shiitake, ginkgo nuts and mitsuba. The soba, on the other hand, was hands-down the best soba we’d ever had. Granted, we’d never had freshly-made soba before (yes, I know, we were too busy eating sushi during our trips to Japan). The texture was thick, chewy, and had a lovely, toothsome bite to it. It was made out of some special buckwheat from Canada (we paid an extra $3 for the option), which had an even deeper and richer “buckwheat” flavor. Of course the toppings on our Uni Ikura Soba ($18) were hard to beat. Uni (sea urchin), ikura (salmon roe), and shredded shiso leaves were served with a bit of wasabi and nori (dried seaweed). That’s a winning combination, and this was no exception. I loved how the creamy richness of the uni, briny “pop” of the ikura, and sweet, almost “minty” notes of the shiso came together so perfectly. The noodles were served with a simple, cold soy-based dipping sauce, a perfect agent to bind everything together. Keeping the liquid separate until the last possible moment allowed the texture of the noodles to shine. For the sake of variety, we also ordered a “hot noodle”: Ebi Tempura Soba with shrimp and vegetable tempura on the side. The flavors were solid and the tempura was quite expertly fried. However, the hot soup made the soba just a tad softer than the cold version had been. It was harder to appreciate the incredible texture of the fresh soba quite as much when it was in this slightly “soggier” state. Though it was still very, very good, I could tell it wasn’t quite the same. Overall, however, we had a fantastic time there. According to Guchi (none other than the Midnight Ramen guy), Soba Koh is a favorite amongst those in the restaurant industry. Unlike the ramen places in the city, this place has yet to be discovered (and thus not yet mobbed) by the noodle-craving masses. However, those in-the-know come often to enjoy the delectable handmade offerings, and Guchi’s no exception. He loves going there as well (and he’s a noodle expert!). I would highly recommend coming here. The ambiance is pleasant, the prices are reasonable ($8 to $18 for soba), and the food is fantastic. You get to sample something that’s pretty hard to find on this side of the ocean. Seriously, how often does one get access to fresh, homemade soba in the States? Even if you wanted to make your own soba, how hard would it be to land one of those crazy soba cutting knives? We absolutely loved the fresh soba, and I’d argue it’s worth splurging the $3 to get the special buckwheat if it’s available. Even if not, I’m sure the normal handmade soba will far surpass any dried kind you’ve ever had. this is awesome! really seems like a place that takes the craftsmanship of soba seriously. will have to keep this in mind for a future nyc trip. Thank you for your soba report. I enjoyed it. I was grew up in Tokyo so I miss good hand made soba very much. San Francisco has a couple soba restaurants. They are OK but of cause no home made soba noodles. So they, Soba Koh has some fusion appetizers, interesting. This time of year, Japan is very hot, so everyone eats cold soba (Zarusoba). I miss Sanshoku soba (white sesame, uzu and green tea soba), 3 kinds soba served on a bamboo soba tray with dipping sauce bowl. Thanks for posting. This look delicious.